Beautiful examples of French colonial architecture, tree-lined streets, busy shops and cafes spilling onto the sidewalks give Hanoi a character rarely seen in Asian cities. Thousands of motorbikes, cars, bicycles and pedestrians compete for space on the narrow streets. Horns honking, a peddler’s singsong sales pitch, the happy roar of diners at an al fresco cafe—Hanoi is a city that never seems to slow down. Still, everyone makes enough time for relaxing with friends and neighbours, sharing cups of sweet, strong coffee or a few glasses of cold, draft beer. Other Asian cities may have bigger markets or more glittery temples, but few cities offer such a sense of “otherness.” There is no better way to experience Hanoi than to walk through its many micro-neighbourhoods. One street specialises in medicinal herbs and teas, another sells bamboo. If you want sweets or household goods, mobile phones or picture framing, there is a micro-neighbourhood that specialises in it. In many ways, Hanoi is a deeply traditional city. Hanoians tend to be a superstitious people, and at each new moon, fires dot the city streets as paper offerings are sent to the gods and ancestors with prayers for good health, luck and prosperity. Healthcare has improved dramatically over the past few years, and Hanoi now boasts the only internationally accredited general hospital in Vietnam. Medical care at Vinmec is surprisingly affordable, too. Seeing a specialist only costs about $40, and the hospital is equipped for everything from outpatient consultations to major surgery. Hanoi is affordable in every aspect. Expat John Powell, who moved to Hanoi two years ago, says, “I am continually amazed at the low cost.” A furnished, 232-square-metre, two-bedroom house in the upscale embassy district starts at around $650 per month. Experienced housekeepers charge less than $3 per hour. High-speed internet plans start at around $13 per month, and a bag full of fresh vegetables from the local market is less than $3. It is not necessary to own a car here. There are plenty of inexpensive taxis and the city has an extensive public bus system, where a one-way ticket costs about 40 cents. Hanoi has a vibrant street-food scene. A baguette filled with egg or meat and fresh vegetables costs about $1.30, and a dinner of duck, sliced bamboo, noodles, greens, and a beer costs less than $4. There are also many upscale restaurants, but even here, prices tend to be much less that you might expect. New places are popping up nearly every day, offering an expanding array of international cuisines ranging from Mexican and American to Israeli and Indian. A couple could live comfortably in Hanoi for well under $2,000 per month. This amount takes into account rent, utilities, weekly housekeeping, eating out daily, entertainment, public transportation, a monthly trip to the doctor and the occasional sightseeing excursion. Life in Hanoi is never boring. Hidden temples and ancient pagodas are interspersed between grand French-styled mansions, pretty lakes and shady parks. Vietnamese people can be irrepressibly curious, and are quick to welcome foreigners into their homes and their hearts. 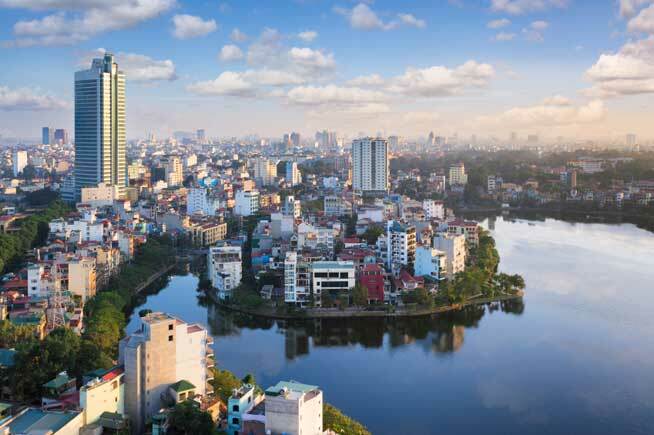 The energetic nature of Hanoi’s neighbourhoods make it an exciting city to explore. Life is anything but predictable, and every day is an adventure. Sign up here for IL Australia’s e-letter and we’ll send you a free postcard e-letter three times a week. We’ll also send you a FREE research report on Vietnam: Experience the Magic of the Orient.